Evolution is the creative force shaping all earthly life. It is also the reason why all multicellular life is susceptible to cancer. The processes of evolution are the fuel behind the interplay of malignant cells and the bodies they attack. Cancer may be the ultimate laboratory for the study of evolution. Here, in the thicket of cells ceaselessly angling for an adaptive advantage, we see the same processes that alter the course of species over vast tracts of time — evolution in complex ecosystems — play out over the course of months, or perhaps days or even hours. Athena Aktipis and Carlo Maley, both evolutionary biologists at the Biodesign Institute, hosted the conference and kept attendees as well as worldwide followers on social media up to date with a steady stream of live announcements and tweets, while Alex Cagan, an evolutionary biologist with the Sanger Institute in the U.K., provided captivating drawings depicting the highlights of many of the lectures. 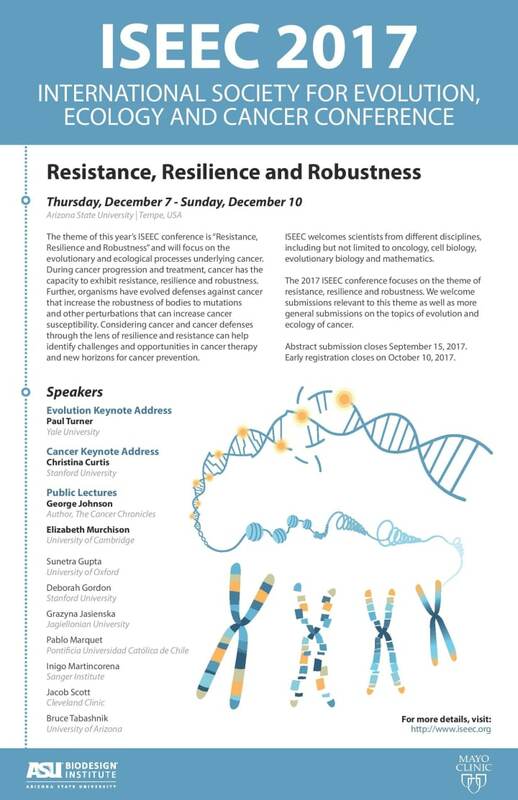 ISEEC was established as a multidisciplinary society, bringing together cancer biologists, evolutionary biologists, ecologists, quantitative modelers, bioinformaticians and clinicians to approach the problem of cancer within an evolutionary and ecological framework. The organization hopes to advance cancer research by employing evolutionary, comparative and ecological approaches and principles to cancer biology, prevention and treatment, as well as engaging the public in fundamental questions about the nature and evolutionary origins of cancer. Alex Cagan created drawings capturing lecture highlights throughout ISEEC 2017, including this panel discussion on the future of Evolution, Ecology and Cancer research. ISEEC 2017 kicked off with a keynote lecture by Paul Turner, "Evolutionary Robustness of Oncolytic RNA Viruses." Turner is a professor of ecology and evolutionary biology at Yale University and the microbiology program at Yale School of Medicine. He spoke of how insights from experimental evolution can shed new light on cancer. His lecture concerned the use of so-called oncolytic (cancer-killing) viruses in cancer treatment, noting that such viruses grow better in cancer cells than in normal cells. Currently, nine different viral families are in clinical trials for cancer therapy. Turner notes that the great promise of viral therapy is that viruses may be able to co-evolve with the cancer. An opening series of talks followed. Carlo Maley, associate professor in ASU's School of Life Sciences, spoke of the challenges of managing resistance in cancer. He noted that while combination therapies have been game-changing in the case of diseases including HIV, they have generally met with poor success in treating resistant cancers. Maley went on to suggest that the field had much to learn from strategies of pest management. Farmers have learned that attempts at full eradication of agricultural pests generally lead to more highly resistant pests, once sensitive pests have been eradicated. Instead, integrated pest management retains some pests sensitive to treatment, which act antagonistically toward the resistant pests, keeping their numbers in check and preventing the assault on crops from raging out of control. Maley also outlined a new consensus statement published in the journal Nature Reviews Cancer, designed to help clinicians classify malignancies based on evolutionary characteristics like cell heterogeneity. Many other lectures explored insect analogies with cancer progression and treatment. In a fascinating plenary talk, Stanford University’s Deborah Gordon described the evolution of collective behavior, focusing on questions of species invasion into new physical environments and cancer invasiveness of physiological environments. Gordon has been tracking the invasive spread of Argentine ants and their interaction with winter ants in the Jasper Ridge Biological Preserve in Silicon Valley, with the take-home message that nothing in evolution makes sense except in light of ecology. Entomologist Bruce Tabashnik, from the University of Arizona, described mechanisms of insect resistance to transgenic crops, showing that when treatment-sensitive insects are maintained in refuges near croplands, they effectively dilute out resistant pests over time, maintaining equilibrium. His lively lecture also highlighted a few cases of poorly devised management strategies and their catastrophic consequences, again with obvious implications for cancer therapy. How do organisms decide if a cell poses a cancer threat? ASU's Athena Aktipis explored cancer susceptibility as an unfortunate fact of life for multicellular organisms in her talk. She noted that the evolution of many-celled organisms opened a space for cells attempting to break free of multicellular constraint — to “cheat” the system for their own benefit, a phenomenon we recognize as cancer. Three kinds of cheater detection were described: cell intrinsic, including DNA damage, misfolded proteins or the presence of viruses; neighborhood threats, including alterations in tissue architecture; and system-wide detection, including immune surveillance and resource usage. “We are made of 30 trillion cells that are tirelessly working and cooperating with one another to keep us functioning so we can live, eat, breathe and do everything else we need to do to carry our genes to the next generation," Aktipis said. "But these cells not only need to do all the jobs necessary to keep us alive — these cells also need to be vigilant to the threat of potential cellular cheaters in their midst that can evolve into cancer. Our cancer suppression mechanisms are essentially systems for detecting and responding to cellular cheating within." Aktipis also highlighted the fact that the cancer-suppressing mechanisms used by large and long-lived species require intense cellular information processing to distinguish between cells that pose a cancer threat and those that don’t. She suggested that this cheater-detection approach may help us better understand the complex information processing happening inside cells, potentially providing important guidance for human efforts against the disease. Christina Curtis is a Stanford University researcher in medicine and genetics. Her keynote lecture underlined the fact that the growth of human malignancies cannot be directly observed. Tumor growth is an evolutionary process with each tumor cell’s genome providing a historical record of its ancestral history. Curtis presented a “big bang” model of cancer in which the very earliest mutations are the most critical for the development of the expanding cancer universe. Such mutations are likely to be found at every stage of cancer progression. Amid the severe challenges posed by cancer resilience, resistance and robustness, there is at least one ray of light. The dreaded disease dies with its victim. Or does it? In a series of intriguing lectures, researchers described new studies of several contagious cancers, including the famous case of the Tasmanian devils, large marsupials who have been devastated by an aggressive, communicable and deadly affliction known as Tasmanian devil facial tumor disease. Beata Ujvari of Deakin University in Australia noted that the disease is not always fatal and there may be some signs of resistance in the population as well as changing mating behavior of the devils, perhaps aimed at curtailing the epidemic. Ominously, however, she notes the emergence last year of a second form of facial cancer. Earliest contagious cancer? A sketch by Emma Werner shows what researchers believe the first dog with this disease may have looked like. It turns out that not even the lowly soft-shelled clam is safe. Michael Metzger of Columbia University described the latest example of evolution at the intersection of cancer and infectious disease — a leukemia-like cancer in clams that can spread through the water to neighboring clams. Not only does contagious cancer seem to be more prevalent than generally assumed, its origins are likely very ancient, according to Metzger, exerting profound selective pressure on all subsequent multicellular life. Celebrated science journalist George Johnson turned the discussion to the challenges involved in writing about science in general (his nine books and innumerable articles cover everything from Soviet radio transmitters to the enigma of consciousness), and cancer specifically. His latest book, "The Cancer Chronicles: Unlocking Medicine’s Deepest Mystery," gives a view from above for a general reader. Johnson delivered a public lecture ahead of the ISEEC conference, which was sponsored by the Beyond Center at ASU and titled "Why Everyone Seems to Have Cancer," and he later spoke to ISEEC attendees. He noted the human propensity for finding pattern and meaning in the universe, stressing that in the case of cancer, the temptation may lead us astray. The disease more often has its roots in bad luck and our evolutionary legacy as multicellular organisms than in aspects of daily life under our control, like where we live or what we eat. Johnson also spoke of the need to balance the scientist’s fascination with one of nature’s most elegant and sophisticated examples of evolution in action with the public’s understandable revulsion and dread at this pitiless disease. A panel of researchers discussed the future of research and funding priorities for the field of evolution and ecology of cancer. Though evolution is the theory of cancer and fundamental to understanding and combating the disease, it remains the most underfunded and underrepresented area of cancer research, a fact Anna Barker drove home in her remarks. (Barker was the deputy director of the National Cancer Institute and is now professor and director of the Transformative Healthcare Networks in Julie Ann Wrigley Global Institute of Sustainability, the director of the National Biomarker Development Alliance, and co-director of the Complex Adaptive Systems Network at ASU). Barker delivered a wish list for the field that included a network of evolution and cancer centers; renewed efforts to bring outsiders into the field; the sharing of common resources; a centralized multidimensional database; and standards and registries of evolutionary math models, algorithms and relevant clinical trials. Alex Sekulic, director of Mayo Clinic’s Arizona Cancer Center, was also on the panel and spoke of the need to build close collaborations with clinicians to use evolution and ecology to solve our most pressing problems in oncology. Dan Gallahan, deputy director of the Division of Cancer Biology at the National Cancer Institute, highlighted opportunities at the NCI to fund research in the evolution of cancer. At the close of the conference, Maley offered final remarks, noting exponential growth of the field and the enthusiasm of attendees for this unique gathering. He said he is optimistic that the excitement surrounding so many new insights and discoveries will encourage many other researchers to apply their talents to the profound puzzle of cancer, as this fast-paced field continues to evolve. ISEEC 2017 was made possible through the generous support of the Biodesign Institute at ASU, the Beyond Center for Fundamental Concepts in Science at ASU, Mayo Clinic Cancer Center, and Genentech — part of the Roche Group. Arizona State University lost one of its most generous supporters last week with the death of Bruce Halle, who built Discount Tire from one small showroom in Ann Arbor, Michigan, in 1960 into one of the most successful independent tire dealerships in the industry’s history. But his generosity, like his interests and passions, spanned many fields and impacted many individual lives. 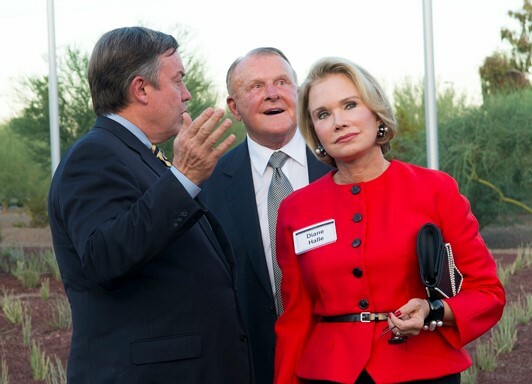 The Halles directed their generosity to ASU programs that deal with education; health care and health care research; the arts, including the Herberger Institute and the ASU Art Museum; scholarships, including those for veterans; and business education. What stands out about Bruce Halle’s generosity is his deep concern for the individual, said Gretchen Buhlig, CEO of the ASU Foundation. “He brought the same care and concern to his partnerships at Arizona State University," she said. "He cared about the individual, and his and Diane’s history here reflects that. We are deeply grateful that he saw ASU as a place where he could make a difference, and that he believed in and supported the mission of the university." Bruce and Diane’s long history at ASU allowed them to aid the transition between ASU’s previous president, Lattie Coor, with whom they also cultivated a strong relationship, and ASU’s current president Michael Crow and his wife, Sybil Francis, when they arrived at ASU in 2002, she said. When Halle started Discount Tire, he rented a small shop and had only six tires. He did everything —changed tires, kept the books, painted the signs and even cleaned the bathrooms. Today, Discount Tire operates more than 975 company-owned stores and employs more than 18,000 people. In 2002, he and Diane established the Diane & Bruce Halle Foundation to focus their giving on gifts that have deep impact. They also established programs through Discount Tire that enable executive employees to make high-impact gifts in their regions. Strong supporters of the arts, particularly through Diane’s passion for Latin American art, Bruce and Diane gave generously to the ASU Art Museum, the ASU School of Art, and the Herberger Institute, as well as to scholarship and visiting artist programs that impacted individual students and artists. Deeply personal in their giving, the Halles recently gave a gift to support the Mayo Medical School — Arizona Campus and its collaboration with ASU. At the time, they said the partnership supports a medical education that incorporates the science of health care delivery and offers the opportunity for a master’s degree.